As I first learned long ago, stray animals are a common sight in many parts of the globe, particularly the third world. I'll never forget when I was witness to a pack of peaceful dogs sauntering by the Greek ruins at sunset when I was in Paestum four years ago. Still, I was quite surprised to see so many stray dogs, or cani randagi, during my most recent stay in Sicily, especially in Palermo. They were everywhere, most often solo, sometimes in twos, and rarely in packs. A self-proclaimed fearer of dogs, I never felt in any danger. It was always a spectacle. While some landowners do the unthinkable and poison the dogs with bait, many Palermitans treat them as part of their community. From Trapani to Palermo, it's not uncommon to see a random water dish on a sidewalk corner. In Rome you have the gattare, in Palermo, there are the dog ladies. After some research, I was sad to find that dog (and cat) abandonment is a significant problem in the south, and there have even been some deadly attacks. Apparently more often than not, local governments ignore the laws requiring them to capture and kennel the strays. Italian author, Diana Lanciotti, wrote a book on this issue. I wish there was an English translation. While there have been national campaigns to end pet abandonment, sadly it remains a problem. Some visitors to Italy have taken it upon themselves to adopt strays and bring them back home. This was my favorite encounter. This adorable stray was taking an afternoon swim in Trapani- hey dogs get hot too! We later saw the same dog walking the main boulevard with a sense of determination and purpose during the evening passeggiata. What have been your experiences with strays (dogs or cats) in Italy? I'd love to hear your take. I was in Sicily recently, at Castellamare del Golfo. I was struck by the number of stray cats (we counted just under twenty one evening down by the harbour) and there were stray dogs in virtually every town we visited. We were followed around town by one of the most beautiful strays I've ever seen, and I was sorely tempted to investigate how to bring a stray home to the UK! Every time we went to a different town there were different dogs. Some terriers, some hounds. What always struck me was how incredibly well-behaved they all were. There was no aggression, no begging, no barking. They were all such incredibly polite animals. Hi Susanne- thanks for your comment! I went to Castellamare del Golfo last summer- I loved the beach there. Yes- the stray dogs were everywhere and all were extremely peaceful and polite (and I am terrified of dogs) although I guess there have been a few unfortunate attacks on people. 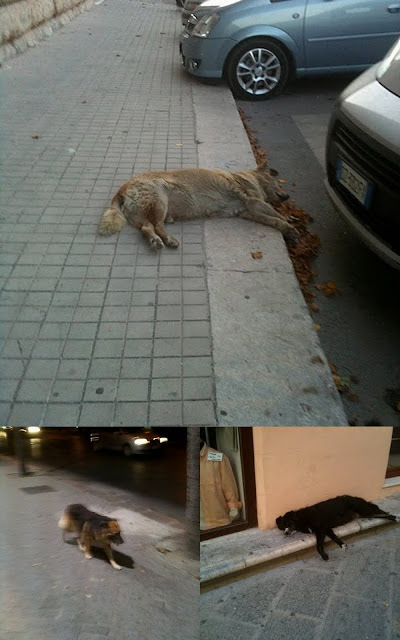 My guess is that the kind Sicilians have a role in the behavior of these dogs. 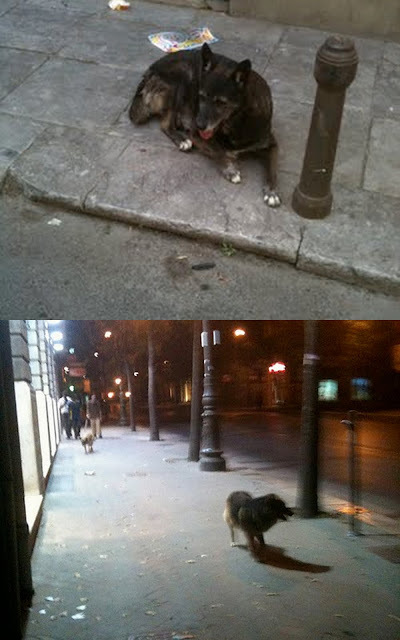 They feed them and take care of them even though they are on the street. You should look into adopting one if possible. Hope you enjoyed Sicily- it's one of my favorite places in the world! It is May 25, 2013, and we are finishing our Sicilian holiday. Has been really good, but the stray dogs and cats break my heart! Being cat lovers, we started buying cat food 2 weeks ago to feed any cats that we see. Anyhow, the other day I saw a poor hungry stray dog. I only had bread and cat food. He ate what I had because was sooooooo hungry. A total IDIOT didn't like this dog sitting in front of his car and started kicking him! I totally flipped out and began yelling and cursing at this jerk! I hope not all Sicilians think so negatively of these poor animals..I'm still really angry about this incident. Just wanted to share this story. Hi Becky- thank you for your comment and story. It is very sad to hear about the kicking incident but I am glad that you were able to help out some hungry cats and dogs. Unfortunately there are some crummy people everywhere, but I know that many Sicilians leave out water dishes, food, and keep an eye on these "street dogs." Hope you enjoyed the island! From your perspective, do you think that Sicily will eventually be more like North America where we have organizations, in most cities, to help stray pets? Hi Katie: It has been awhile since I looked at this post. Yes. Not only do some of these people see dogs as dirt, but cats, too. When we were in Sicily in May, I was feeding a stray cat, and a local woman gave me a dirty look. I commend you for rescuing a dog and feeding others on the street. Does anyone know how to fly back to England with a dog? I'm currently living in sicily, but would like to take my adopted stray on holiday with me. Hi. I've just read you web page about the dogs in Sicily. 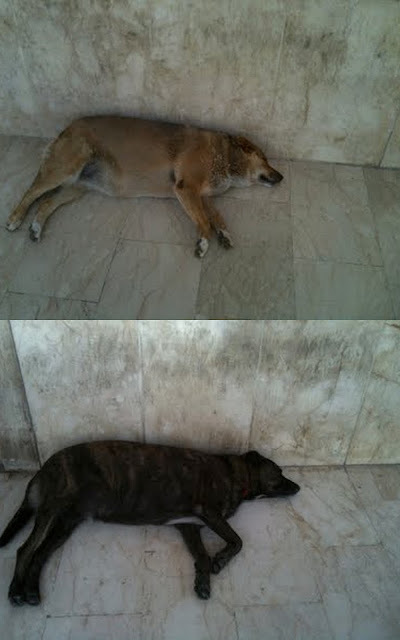 I visited in April 2014 and was so upset about the volume and condition of the stray dogs I wrote to World Animal Protection so see who I could contact or to see if there was anything I could do to support their plight. I too was in Palermo, Trapani, Castellamare del Golfo and even saw a really frightened and unwell dog high up on the motorway. I'm a true dog lover and so felt quite devastated about the situation. In Palermo, a lone man with stray dogs and puppies was trying to raise awareness of the situation and I donated at the time but shortly after, obviously drawing a crowd, the Police moved him on. Not good for tourism! Well sort your dog situation out. I am appalled. I knelt down to one of the dogs in Palermo just to speak to him and show him some kindness and although looked tired and weary, he looked at me so affectionately. I was so moved. I know there are dog lovers in Sicily because I saw them. In Trapani, the community were outraged at the beating of a dog by a drunken owner so I know that some of them care compassionately. If all I can do is hope and pray that the Sicilian find a humane way of addressing the situation, (and I do not mean culling!) then I will hope and pray. Poor little souls. Thank you for your comment and insight. In spite of the overwhelming number of stray dogs in the streets, there are definitely dog lovers taking care of them in a compassionate way, as you mentioned. I haven't been back to Sicily in two years, but I am curious to see if the situation has remained the same. We holidayed in Castelvetrano, south west Sicily. Again like all other contributors we we upset by the stray dogs that hung about the supermarkets. Before long we were buying dog food and setting up feed/water zones. Then we spotted the dog ladies. I am in touch with them now and aware of the treatment of the cats, very few spotted who are poisoned on a regular basis. The horses in Palermo made me very cross or rather their idiotic owners. I shouted at most of them insisting they give their exhausted horses water. Are there any groups who help me help them? Many thanks. Education is needed. Urgently. Apathy breeds apathy. Thanks for your comment. That's lovely that you found the "dog ladies" and in touch with them. In addition to the organization OIPA which I mentioned above, there is also Animals Worldwide (http://www.animalsworldwide.org/). In fact, the press officer for Animals Worldwide founded an organization called "Catsnip" to help neuter wild cats in Sicily. (http://www.catsnip.org.uk/about.html) Please keep us updated on your efforts! Hi, Hanna- thanks for your comment. The last time I was in Sicily was 2012 but I'm hoping to return soon. I will definitely be checking out the stray situation when I'm there and will post an update and any new information I find. Best of luck with your adoption plan and please do keep us posted on the process! We have been 10 days in Palermo leaving tomorrow. The stray dogs I've serm so far have all looked fed and good coats, this was pointed out to me by my husband who was upset that I was getting upset. However the pregnant one tipped me over the edge and I was depressed and still am thinking about her wandering streets breaking more strays. The horses did look confounded by their owners into a life of servitude id never ever ride a carriage. I did try to point out to the driver of one that his horse was trying to trst its back legs and looking into its eyes was a sadnes beyond bearing. He just tried to sell me a ride and ignored my attempts to bring attention to his horses discomfort ... He got angry with me for pointing the hooves out in front of other tourists, potential business. I had to move on. I can't find any information about how/where they keep their horses online? Anyone know? That one horse was in deep misery. Thank you I'm so glad I found this site I needed someone to talk to it has spoilt my trip here and I'm really not sure if want to spend my tourist fillers on an economy that is indifferent so probably won't return. I'd rather spend my hard earned income on places that pay attention and have more pride to show the world beauty. And of course I don't want to be depressed on a vacation. When you're there you do what you can!!! Help the animal! !